Augmented Mirror shows a unique AR effect, which augments the reflection of the real world with synthetic data. Traditional AR technologies typically require the exploration of the augmented real world through video-based cameras and screens, whose limited resolution significantly restricts the AR experience. 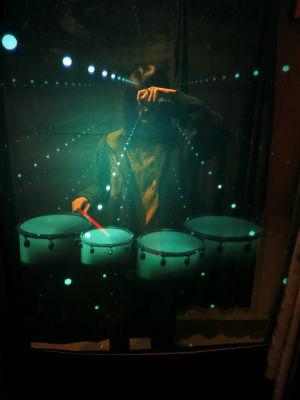 Instead, this work uses one-way mirror, which provides a natural fusion of the virtual and real worlds, like an linkage between two parallel universes. 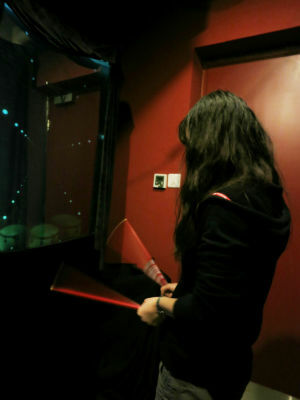 We observed that many people (especially musicians) have the habit of playing "air instruments", having their very personal imaginary performance as if there is really instrument out there. 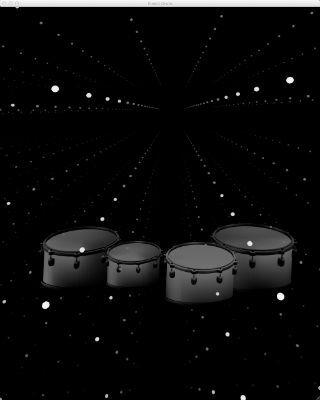 With support of the Kinect system of Microsoft, we demonstrate the idea in Air Drum, allowing the personal imaginary performance to be reflected, sensible from the augmented reflection. It is a large question in Philosophy that whether there are any interaction between the mind and the body of a human. If there is, in what form the interaction is taking place. There is several different ideas toward this topic: substance dualism, property dualism, idealism, materialism etc. The installation is trying to introduce a artistic, new way of mind-body interaction which let viewers to think of this Philosophy question through experience. Some abstract lighting and visual effect is generated by the viewer's emotional state extracted from brainwave data using a EEG sensor. The visualized emotional state and the reflected body of the viewer are corresponding to the mind and the body of the viewer. 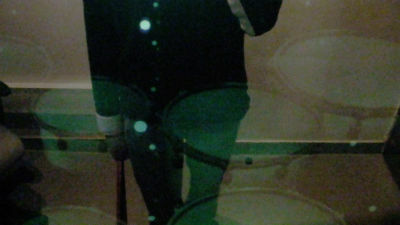 The viewer is allowed to manipulate or affect the 3D content in the mirror, a mind-body interaction is achieved in a symbolic way. This installation art was build in the very early stage as a proof-of-concept. At the time of the development, Kinect had not been released yet. We used two pairs of DIY stereo cameras for head-tracking and 3D reconstruction. 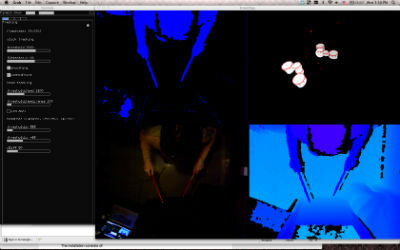 We also experimented 3D anaglyph rendering on Augmented Mirror. SIGGRAPH is one of the major conference on computer graphics and interactive techniques. 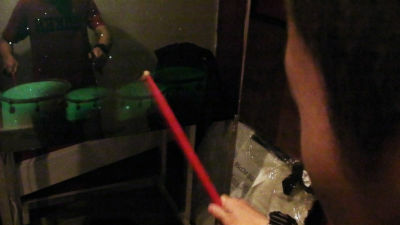 Augmented Mirror(Air Drum) will be exhibited in the Emerging Technologies exhibition. It is the annual showcase of School of Creative Media SIG in City University of Hong Kong. 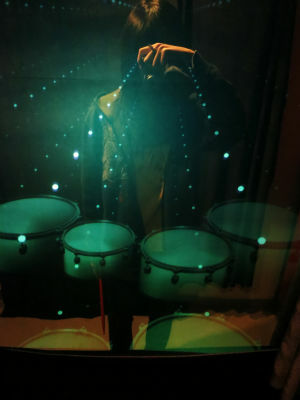 Augmented Mirror(Air Drum) was exhibited as an interactive installation. Andy Li is currently a PhD student in the School of Creative Media, City University of Hong Kong, researching in the field of computer vision, interactivity and installation art. He likes programming; he is an active member in the open source community, including Haxe, openFrameworks, etc. He also likes creating art in various forms, including generative art, painting, sculpture etc. Hongbo Fu is currently an Assistant Professor in the School of Creative Media, City University of Hong Kong. Before joining CityU, he had postdoctoral research trainings at the Imager Lab, University of British Columbia, Canada and the Department of Computer Graphics, Max-Planck-Institut Informatik, Germany. He received the PhD degree in computer science from the Hong Kong University of Science and Technology in 2007 and the BS degree in information sciences from Peking University, China, in 2002. His primary research interests fall in the fields of new media and computer graphics with an emphasis on digital geometry processing. Andy Li, Hongbo Fu © Copyright 2012, All rights reserved.